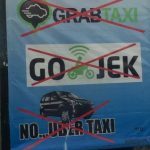 As Uber (Grab, Gojek and other apps included) continues to linger in the local news, we thought you might benefit from some tips on how to use Uber in a way that will not attract the wrong kind of attention. In Bali, taxi companies and local transportation groups despise Uber. They hate the effect this new company is having on their attempts at monopolizing certain markets. Illegally. Really, the airport, certain touristic beaches, and some of the busiest streets (featuring Bali’s most famous nightclubs) are victim to transport monopolies that frequently gouge tourists for 2-5x the normal price (and sometimes even more!). And they do so with malicious attitudes (read on for some examples of that!). This, ladies and gentlemen, is the epitome of opportunism in Southeast Asia. As I’ve previously written here, if taxis and freelance drivers/transport groups used legitimately functioning meters and offered fair market prices, the opportunity for Uber would cease to exist. But now, instead of getting, say, 10 fares in one shift, many drivers are ‘happier’ to get 2 fares, but each at 5 times the normal rate. It appears they want to work less for the same amount of money. Sure, maybe the cost of fuel/gas consumption might factor into a little (like really a little - most taxis are newer models and very fuel efficient). But the fact is they are hustling when they don’t have to be. It requires much more energy, and causes aggravation for both parties, when being opportunistic - as opposed to offering a fair price and most customers gladly accepting it with a smile. But luckily, in the case of transport in Bali, it’s a buyers market. Until that last scenario happens, we should exercise our freedom as consumers to use the service that makes us happy… the service that is convenient, honest, of good value, and most importantly- accountable. So why these tips on how to use Uber? Drivers and riders of these apps must be conscientious when using the service. I’ve had friends followed around by groups of drivers at the airport, Uber drivers have told me they’ve been cursed at, had knives pointed on them, and people (especially foreigners) who have publicly supported Uber have received threats of all kinds. This isn’t meant to dissuade you from using any of these kinds of services, but if you do (and you should), please take the following recommendations to heart to ensure your pickup and drop-off go without conflict. The primary reason for this: to never be seen paying the driver. Any jealous parties will find it hard to decipher the arrangement between you and your driver if you aren’t seen paying them in cash. Sure, sitting the in back seat indicates it’s not a friend who is dropping you off at the airport, but to be frank, it’s none of anyone’s damn business anyway. The focus here is to avoid a red flag that indicates “Hey, look at me, I’m using Uber, openly in your (greedy) faces!” Your driver could be hired through the hotel, recommended from a friend, found online, the list goes on. As mentioned above, it’s none of anyone’s business. If you have a credit card that gives you a fair foreign exchange, like the Chase Sapphire Preferred Card, you can earn points while saving time and not worrying about paying in local currencies or having exact change. Additionally, if you’re on a business trip, this helps you track business expenditures more easily. And when the fare is incorrect, simply send a message directly in the app. Uber, for example, is really awesome at rectifying fare issues in a very timely manner. They will typically credit your account accordingly within a day or two. Gotta love it! U-B-E-R, or whatever app you’re using…don’t say the name…EVER! Obviously this pertains to pickup and drop-off locations. Take this as a wonderful opportunity to practice your Bahasa. In the airport and leaving nightclubs you will be harassed the most for transportation. My default reaction is to slightly raise my open hand, palm out, while closing my eyes and shaking my head side to side. Nothing too dramatic, just do it casually and politely. A half-smile seems to help with the politeness part. This builds on the previous point about not saying the name of the app around the wrong people. You certainly don’t want to be the idiot walking around with his or her phone in hand, app open, while very obviously trying to find the white Toyota Avanza with plate number DK123YZ that you booked through Uber. Take note of this info when you book the trip, but don’t constantly stare at the app and be watching the position of the car. This may get noticed and invite the attention of those whose attention you don’t want. While many of the people driving for these apps speak English, many don’t. They are all Indonesian, and if they aren’t, they are working illegally. This is yet another great reason to buff up on your Bahasa. The driver should always call you after booking; it’s kind of their responsibility. If they don’t, after a few minutes send a text message or call them. I’ve cancelled trips because the driver never tried to contact me or was rude on the phone. Don’t be shy- take advantage of the fact that someone will read the feedback you provide about your less-than-positive experience. There aren’t a lot of checks-and-balances in Indonesia; but if there were, it would only help raise standards, which is not exactly a bad thing. Anyway, establish a pickup point that is both convenient for you and acceptable for the driver. Certain nightclubs will require that you walk several hundred meters away before you are out of the transport mafia’s radar. In the airport, some apps indicate favorable pickup locations during the booking process. Either way, discuss it with the driver- they should know best depending on where they are picking you up. Refer to him/her by name and start treating them like your privately hired driver as opposed to your Uber or Grab driver. Also, you might really like them, and they might offer their number for the next time you need a ride. Personally, I don’t recommend this. Stay within the confines of the app for consistent fair pricing and more importantly, that accountability thing. I know some of the stuff in this article makes you wonder why the hell you would put yourself at risk to save a small handful of cash. I’ve mentioned some of the scarier experiences, basically the most extreme and uncommon ones. If you’re staying in Bali for an extended holiday or just moved here, the amount saved by paying fair market prices vs. inflated mafia prices will add up very quickly. It’s also about not agreeing with illegal monopolies, corruption, unfair business practices and a lack of accountability. As a consumer, you have very right to choose whichever method of transportation you wish. This article is simply a little guide to make the obvious choice that much easier. 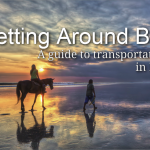 If you’ve found this information useful, then you may also consider our eBook, The Ultimate Guide For Moving To Bali, or our one-on-one BaliManual consulting service for more personalized insight and recommendations regarding anything Bali.